A aby těch změn v kapele nebylo málo, máme i nového bubeníka - Matěje nahradil Mates - a pilně pracujeme na tom, abychom (poté, co jsme s ním onoho památného jedenáctého dubnového dne roku 2017 v katastru obce Jižák zorali prvních pět brázd) mohli na podzim opět sklízet. O termínu této díky Matesovi pro naši kapelu význačné koncertní sklizně vás tady budeme samozřejmě včas informovat. 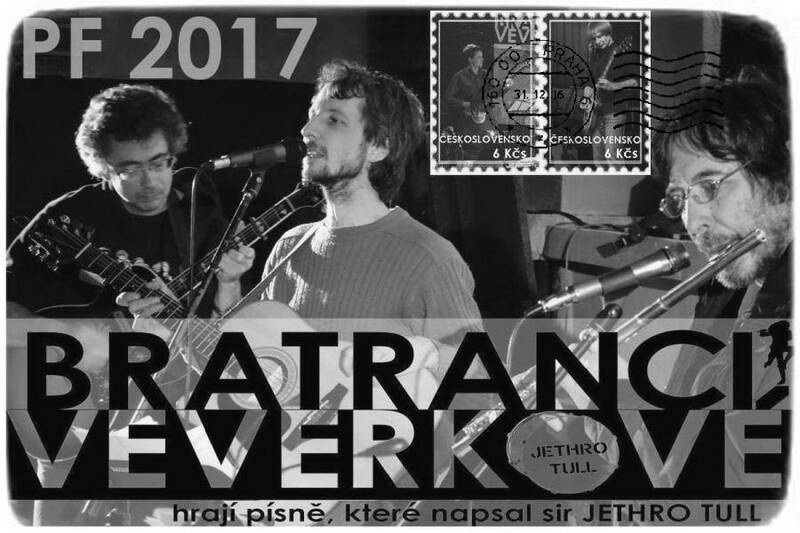 And now for some more big news: September's get-together of the Czechoslovak Jethro Tull fanbase (see below) will continue on the 8th October 2016 in Prague! 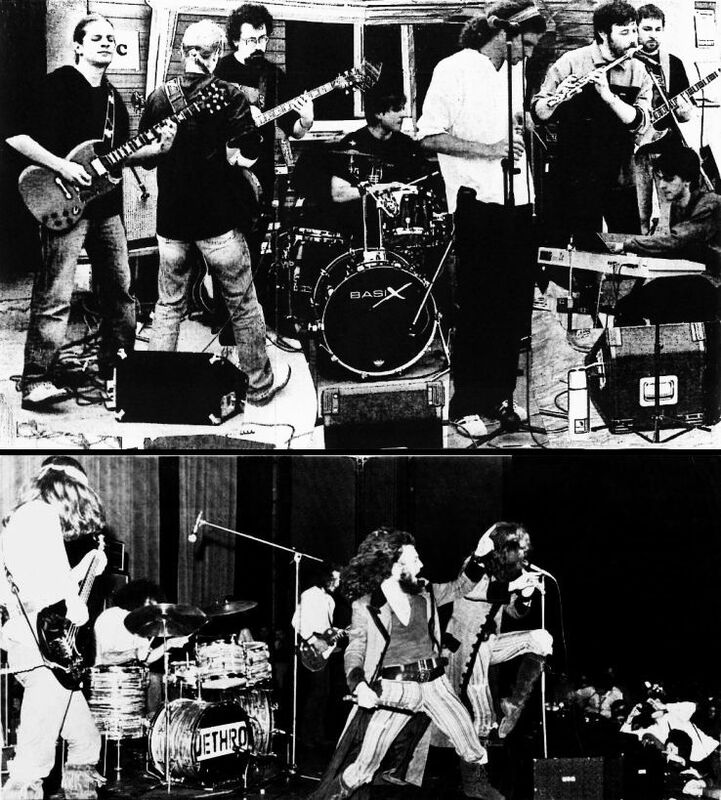 No Jethro Tull fan would turn down the opportunity to attend the exclusive concert of THICK AS A BRICK - Tribute to JETHRO TULL, which will arrive all the way from Trier, a city on the German-Luxembourg border, to perform at the Jethro Tull event of the year named "Jethro Tull and their blues roots"! 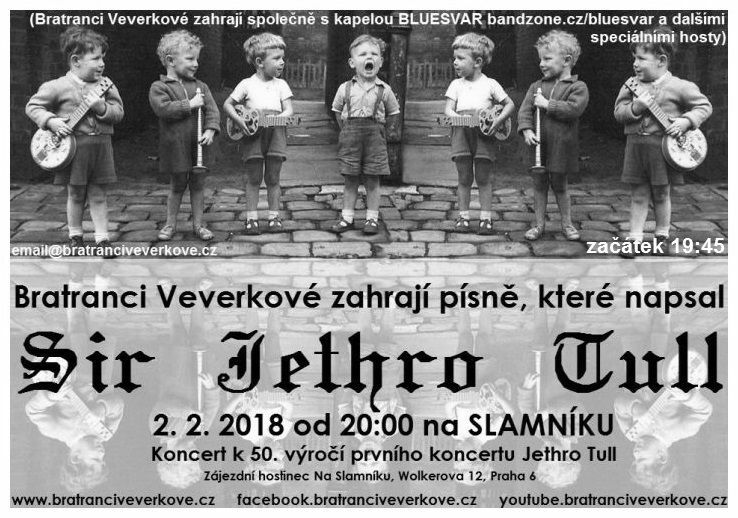 The concert will take place at the unique venue DEJVICKA KLUBOVNA CLUB, and along with our friends from THICK AS A BRICK you will hear the wonderful hard-blues-rock RED BARON BAND and their guests. 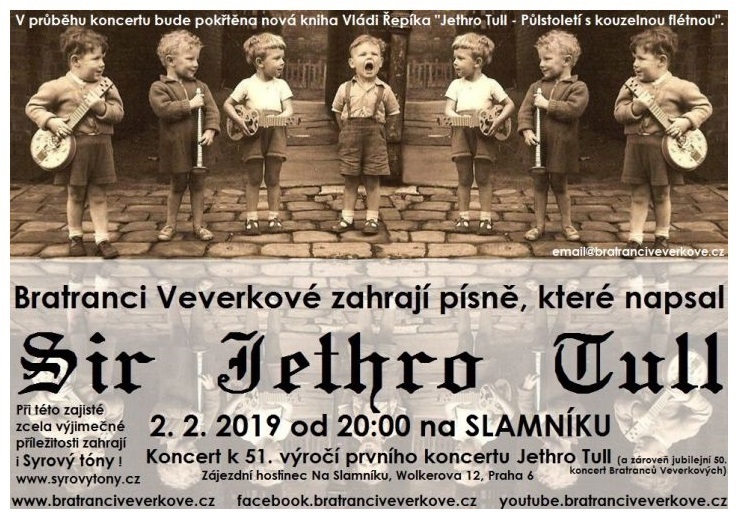 It's going to be a truly amazing night, and whoever stays home will miss a once-in-a-lifetime opportunity to hear one of the world's best contemporary bands playing Jethro Tull music. Please come, the evening will be worth it! So, this time, on the contrary, we thank to all who came to congratulate on our tenth birthday on Saturday June 6th 2015 - not only to all thirteen performing guests but also the audience without whom the party weren’t so successful as it was. And because really special guests came, maybe some of them not to be seen at any other time and anywhere else in the future, you can see the whole of our celebration not only in visual but also audial and sometimes even audiovisual format at our website HERE. After this huge celebration we gave June 14th 2015 a little light concert at Kulturacek Bila Hora (you can see HERE the excellent photos from Martin Fendrych published with his courtesy on our site, for which we thank to him at this occassion) and now we invite you again to our next public appearance on Sunday October 18th 2015 tentokrát opět na naší domovské scéně ve Vagonu. Pozvali jsme si tam kapelu Exit Orchestra, spřízněnou s námi naším (a jak už to v podobných případech bývá i jejich) společným bubeníkem. Exit Orchestra je kapela výborná, tak doražte do Vagonu opět v hojném počtu, těšíme se na Vás! Více informací jako vždy v menu v sekci ORBA! 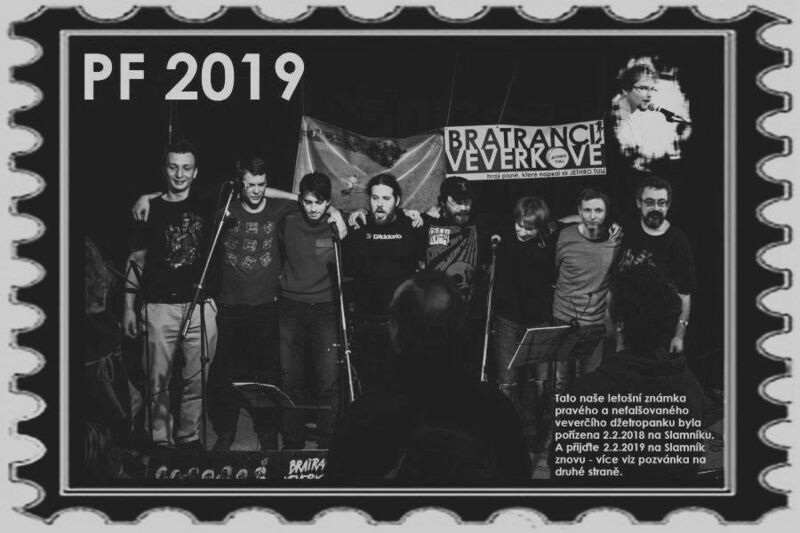 So we have successfully Baritone (our performance in Baryton music club) behind and we thank to all visitors and the band H for the successful concert (in addition please look at Youtube for our version of Aqualung and Lick Your Fingers Clean recorded during this concert, ke které jsme dokonce byli nuceni vyrobit i náš první hudební "videoklip") and look forward to a rock club Kain, where on June 6th 2015 the birthday of Bratranci Veverkové will be celebrated which is actually the tenth anniversary of our first gig (the June 12th 2005 in Ricany see ORBA!). The mighty Pink Floyd revival IT Crowd comes to congratulate us on it and besides them you can also look forward to unprecedented musical surprises at our concerts, which however can't be either divulged or in any way suggested because then it would, of course, not be a surprise. So we hope that you definitely wo't miss that and come with us, Pink Floyd and the mysterious musical guests to the Kain to celebrate our tenth birthday or "Ten years of Squirrels in Kain" (June 6th 2015). We look forward to you! 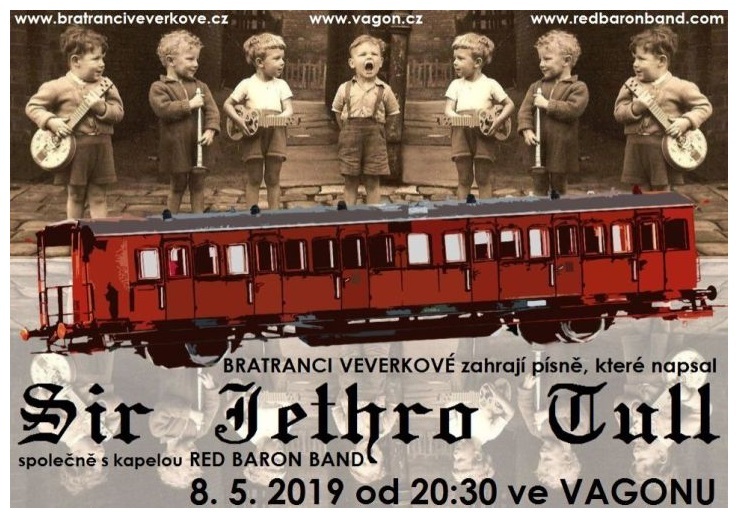 We thank the Saville Row band for absolutely great joint concert in the excellent Brno club Melodka - and now up to the underground club Barytone at Zizkov where we will play along with the band H (see ORBA!) as soon as May 3rd 2015! Thanks to all seventy-one brave visitors (disregarding the fact that the January 25th 2015 was relatively unfavorable day, Sunday) who supported us at our official and even double debut concert in Vagon (except that it was our renewed premiere after "showing of" Slamník, we played a recently rehearsed song for the first time which none of Veverkas has ever played before, but whose name, however, from the perspective of this site will remain a secret until next time that it could be a surprise for those who didn’t arrive at our last show) and also made a genuine unadulterated rock band boiler below the stage to mighty Saville Row band who came from as far as Brno to enjoy the atmosphere at Vagon. 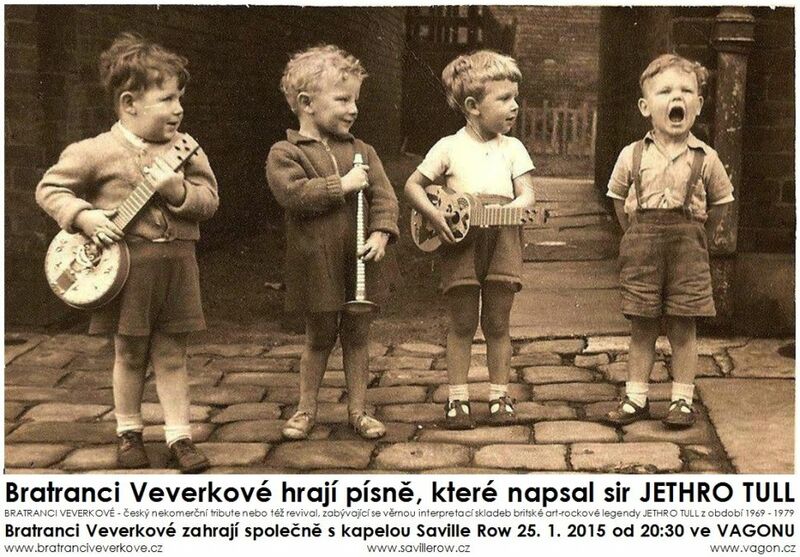 And because we and Saville Row enjoyed playing together we will repeat it, this time in Brno, on March 20th 2015 in the splendid club of Melodka (see ORBA, menu, useless to navigate you like this anymore isn’t it?). So we are looking forward to the audience from Brno (and perhaps Tišnov as well) and we believe that you will arrive again in great numbers! Bratranci Veverkove wish all their fans a Merry Christmas and a Happy New Year. PF 2015 can be found HERE (jpg). An invitation to the Vagon club for January 25th 2015 can be found HERE (jpg). 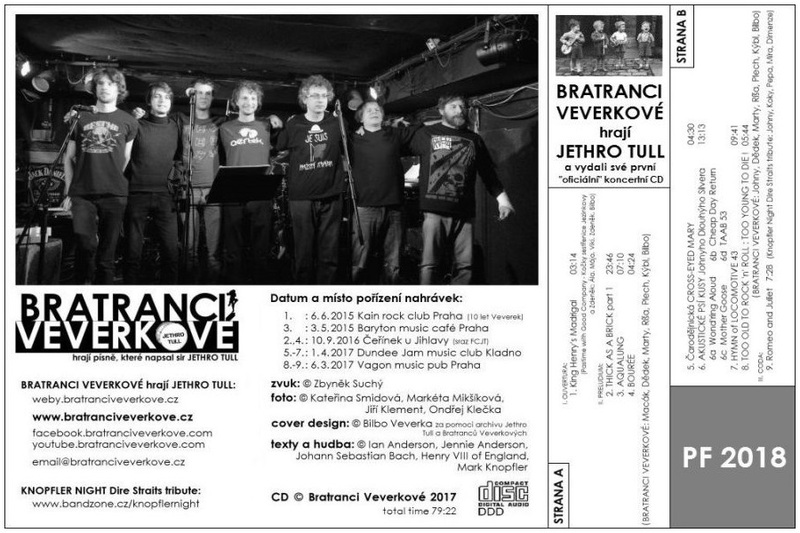 It is so that Bratranci Veverkove live from September 24th 2014 even on Facebook once again (click on the Facebook link in the section LINKS). And simultaneously with the creation of our website in this "nicely Czech suggestive book" we have sown so that we could harvest a little bit at the end of November. Although the weather was not very favorable for plowing during holiday, the indian summer will be exceptionally fruitful agronomically according to recent reports. Thus we believe that the end of the harvest at Slamnik club will come out well, after all at least a little longer than last year. 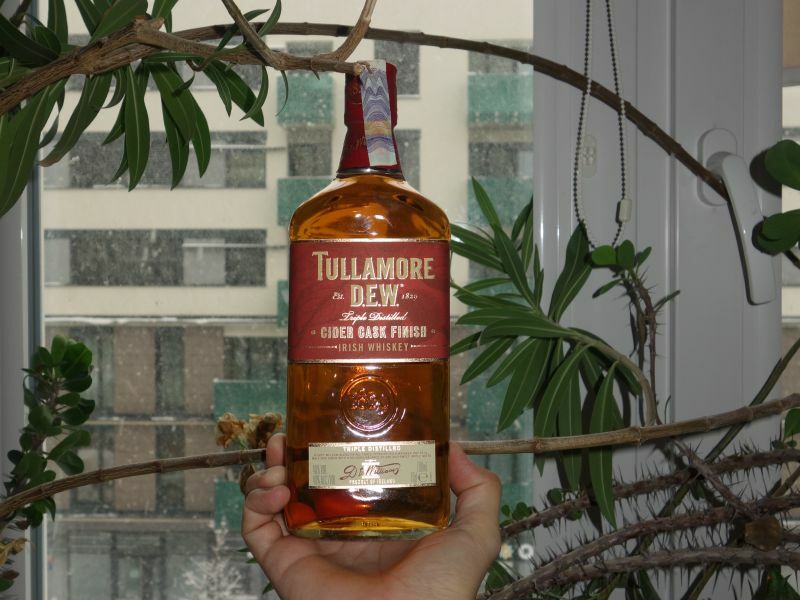 Therefore come there on November 24th 2014 to taste both some of our crops grown this year and the amazing achievements resulted from many years of breeding "Tygers" by our friends from Opava and its wider area (no much farther than 200 miles). See the section PLOUGHING! for more information. We have formed a new line-up and started frequent rehearsals. We are working hard so that we could organize a huge harvest home celebration in honour of making the first four rows with our tiller reused again on the memorable day of March 24th in the year of our Lord 2014. On that day we all performed together in the field of Kolben’s Farm (the land of Vysocany). Since then we have made 7 more rows and, of course, we intend to make many more ones (including some new creations). Our live shows will be presented as "Bratranci Veverkove". 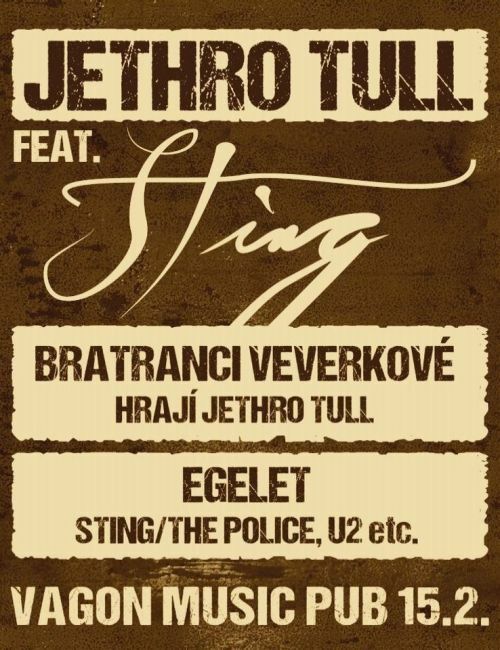 Even though we will play the best of Jethro Tull music we are no "Jethro Tull Tribute Band" anymore. Today May 14th 2014 these web pages are formally restored again. The band has split up up to date (November 14th 2013), our collaboration couldn´t continue so we parted. There are two descendant bands each of whom will promote themselves separately. Thank you very much for your support which you have been giving us for 9 years of our existence. And that it wasn't so sad neither serious at all in this part, HERE is (slightly modified by a "stamp") Bilbo's funny notice of the same predicament (which hadn‘t got away even without the modifications then) - because as it was published long before us, in another place and certainly a lot better by a major Czech thinker J. D. Cimrman: "Prankish disguises have never been, are not and will not be stopped!"